Ali had been practising yoga for many years but awakened to the understanding that 'all life is yoga' only after a first visit to India. So every year she returns there to 'plug back in' and seek new inspiration. Trained in the Akhanda (meaning 'wholeness') style of Yogrishi Vishvketu in Rishikesh, her teaching places a strong emphasis on breath and inner enquiry. As a holistic yoga therapist Ali works particularly with mental health and eating disorder recovery. Her personal practise continues to evolve, anchored through the years by Babaji's Kriya Yoga. Through yoga Ali feels she finally made friends with her body and discovered a blueprint for a more conscious life off the mat. She is passionate about all that the ancient streams of yoga have to offer us in facing the challenges of modern life. The journey into sacred sound began, reluctantly, through mantra; and feeling a call to go deeper she was guided to the gong, studying with leading gong masters Don Conreaux, Tom Solton and Abby delSol (Tone of Life) and Sheila Whittaker. Home is a house boat, 'Epona' on the river Stort, where connection with nature keep her feeling grounded and alive. 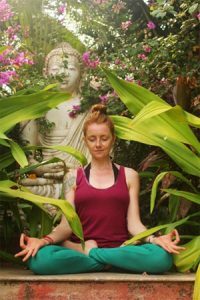 You can find Ali for classes, workshops and sound baths at The Well Garden in Hackney and throughout Hertfordshire - or hosting retreats in India. 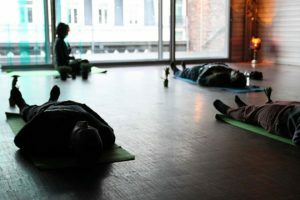 Ali co-created 'Resonant Retreats' with raw food chef Francesca Paz; encouraging us to connect with the seasons and connect with our authentic selves. Writing has been a love since childhood - through a 'past life' bashing out marketing copy to today blogging about all things yoga and sound related. The writing that has most inspired her is 'I, Lalla' the poetry of Lal Ded and, of course, 'Autobiography of a yogi'. So you’ve found your technique, bought the cushion and marked out a spot in the living room. In some ways meditation is not the hard bit; yogis tell us it is our natural state of mind to be still, present and content. No, often the hardest part is the motivation to make it part of our daily life. To just sit. We read how good meditation and mindfulness are for us, we even begin to experience it, but still sometimes the will is lacking. Take an inspiration a day as the motivation to sit, walk, breath – or however you bring yourself towards stillness.